Wengenkirche (which literally means “church on the meadows”) was built in the early 13th century. During wartime, the church that used to be located outside the city in a valley was brought into the city walls. Only a couple of years later in 1399 the church rebuilt on its present-day spot and was consecrated to Saint Michael. 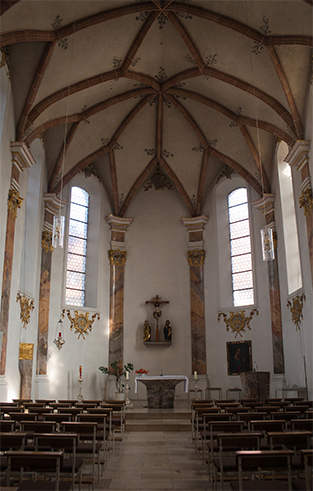 During the times of Reformation most of Ulm’s inhabitants converted to Protestantism and the Augustine brothers of Wengenkirche were instructed to attend to the remaining Catholics. Since Wengenkirche was the only Catholic church in town back then it became a refuge for Ulm’s Catholics. As a “tolerated foreign body” within the city it was especially important for emigrants who often came from Catholic areas. In the 18th century, more and more emigrants from German regions came to Ulm. Many of them only got married here, for different reasons. For one, some couples had not had time to get married in time for their departure or had not been permitted by the authorities. On the other hand, many of them had only met on their journey. Furthermore, married couples were treated favourably in regards to settlement in Hungary since it was important to the Habsburg monarchs to settle functioning families in the Danube region who would be able to work profitable. One can thus guess that some married out of convenience. 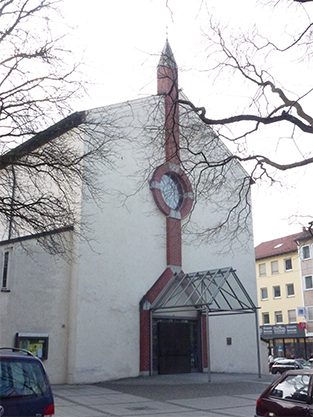 The monastery belonging to Wengenkirche was given the right to marry emigrants. In order not to draw the attention of the Protestant city administration to the marriages, many were held in secret. During World War II, Ulm was bombarded severely several times by the allies and the cityscape largely destroyed. Wengenkirche was not spared and was demolished in an air raid in 1944. The church was rebuilt and enlarged after the war. The only remaining element is its gothic gable to the west which contains the foundation stone relief. In 1997, the simple, almost bare interiors were transformed into a light-flooded space. Today, Wengenkirche is the congregation of Ulm’s city centre and thus still the only Roman-Catholic church on the premises of the old town. The choir at Wengenkirche in Ulm. Services: Sa at 6.30 pm, Sun at 10 am, 6.30 pm (sung vespers), 7 pm.